Moon Dogg is my second novel, a story about a man’s murder in the Sonora Desert. He then finds himself in the body of someone else, but with memories of his past life. I consider this story a solid example of comic fantasy; the saguaro cactus dance and the thunderbirds hover overhead, waiting to take Coyote on his journey. I bumbled into Pima County AZ. visiting my sister who had just moved to Tucson and knew right off I'd found the setting for Moon Dogg. The spirituality of the story comes largely from the legends of the Tohono O’odham Nation who live there. Moon Dogg by Michael Greco is the story of a man who dies and comes back to life in the body of a teenager. While the story itself is very intriguing and interesting, it has strains of mysticism and spiritualism that added a new layer to the story. Dogg is an amazing character; he is complex and ready to change the world with his own brand of skepticism. I enjoyed how the characters were given depth and a chance to grow to become better and more defined. This is the story of small-time Arizona filmmaker Jerome Doggman, a man who is anti religion. So you can image his shock when he is killed and he wakes up again in the body of a teenage boy who has a very religious family. Living the life of everything he stood against, Doggman has no idea what is happening to him. Now a boy, he is shocked to find that he is falling in love with the older sister of the boy in whose body he woke up. What is happening to him and why is it happening to him? Why did he wake up in the body of a boy who has been in a coma for almost a decade? What is the purpose behind it? What I loved most about this very well written and well thought out story was its pace. The author did not rush anything; he let the characters grow at their own pace and let them discover things on their own. This is the kind of character development that I love the most; where the character leads the story and not the author. I loved how Doggman grew, adapted and understood things for how they are and not what he thought they were. I enjoyed the mystery and the whole spiritual theme of the story as well. All in all, this was a whole package that I thoroughly enjoyed. Moon Dogg is a work of supernatural fiction written by author Michael A. Greco. Based on the cultural concept of reincarnation, as observed by the indigenous tribespeople of America, this complex and winding tale describes Jerome Doggman’s penitence when he is killed in the middle of one of his film-making exposes. Returned to life in the body of a religious fundamentalist teenager, flashes of Doggman’s old life continue to haunt him as he spends his time living in the mind of the very people he used to hate and go after as a film-maker. What follows is a deep journey of self consideration and a spiritual experience set in the Tohono O'odham Indian Nation of southern Arizona. Set up as both a spiritual exploration and an allegorical tale, the complex narrative and shifting perspectives of Moon Dogg will not be to everyone’s taste. There is a hint of James Joyce’s Ulysses about the structure in that the more you read, the more you understand, and when full understanding comes the conclusion of the novel is very satisfying. It is also a visceral experience, putting you deep in Doggman’s psyche with direct prose and powerful dialogue that force the issues of life and the differences between people to be discussed. Author Michael A. Greco has done an excellent job bringing the region of southern Arizona to life, filling it with the true culture of the indigenous Americans and their magical, paranormal ways. Overall, Moon Dogg is sure to please an audience looking for a spiritual fairytale. 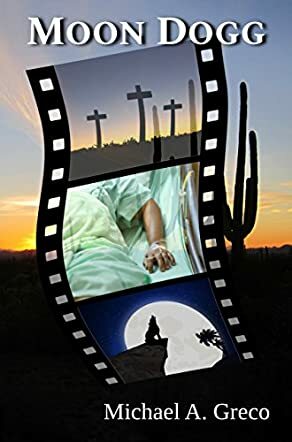 Moon Dogg by Michael Greco is the fascinating story of Arizona filmmaker Jerome Doggman and his scheme to film an expose of an indigenous American tribe and their religious beliefs. Jerome, a.k.a. The Dogg, is murdered before he gets started, but instantly finds himself reincarnated in the body of fundamentalist teenage boy who has been in a coma for eight years. Vehemently anti-religious in his previous existence, Dogg suffers life among the people of his own contempt. Unbeknownst to those around him, Dogg struggles with this new life and the confounding mysteries of his reincarnation while falling in love with the teenage boy's older sister. Moon Dogg mixes in the confounding but enchanting mysticism of American Indian life in the Arizona desert. In his new life, Dogg reviews events in his previous life and tries to make sense of his new situation. Meanwhile, his killers sense his renewed presence and intend killing him again. Michael Greco takes on the monumental endeavor of portraying several of life's mysteries within the framework of a story that encompasses life, death, empathy, love and hate in an unusual narrative style that often had me re-reading pages to ensure I'd understood what I'd just read. There are many scenes that will have you laughing and some will leave you sad, on the verge of tears. All in all, Moon Dogg is an excellent effort to entertain while simultaneously exploring profound concepts of life, religion, love, and time. This is a story that demands your full attention, but rewards you handsomely at the end.